Does Carmelo Anthony make sense for this Nuggets team? Could Carmelo Anthony make a return to the Denver Nuggets this season? With the imminent buyout/stretch/trade of the former Nuggets star from the Oklahoma City Thunder, it’s an interesting question to ask. Let’s get this out of the way; the chances are very, very small for a what will be a multitude of reasons. Not the least of which is the Nuggets current salary situation, which includes the need to clear out a couple expiring contracts — forwards Darrell Arthur and Kenneth Faried — in order to make any substantial movement. Maybe it would not be the ideal way to bring back a former star who forced his way out of Denver over seven years ago? From a basketball perspective, Melo coming back to the Nuggets wouldn’t make too much sense considering his play while with the Thunder. 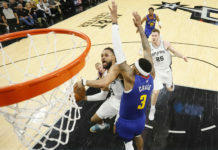 The former All-Star put up the lowest numbers of his career across the board and was even benched down the stretch in the final two games in the Thunder’s first round loss to the Utah Jazz. Again, not ideal in any way shape or form. Additionally, Melo is 34 years old and doesn’t occupy the same timeline as a majority of the “core” players on the roster (Paul Millsap aside). Stylistically, Melo is very much a product of the mid-2000s. This was before the hyper emphasis on 3-point shots and spacing. Carmelo Anthony and a mid-range jab step jumper are synonymous. In Carmelo’s heyday, it was lethal and I’d wager that he was one of the best mid-range basketball players of that era. If not THE best. However, basketball is all about spacing and spread pick-and-roll at the moment. It is hard to envision spacing-obsessed teams, let alone the Nuggets, excelling with a ball-stopping Carmelo Anthony occupying the mid-post. In that way, nothing about Melo returning to tread the boards at Pepsi Center makes much sense at all. However, do you feel that tug at your heartstrings? Come on, admit it. You do. There’s a storybook ending here that is just too tantalizing to ignore. Picture it with me, if you will; a star player who forced his way out of Denver by demanding a trade to a bigger market comes back to the town where he played his best and reclaims his legacy. I mean, it definitely has a ring to it. 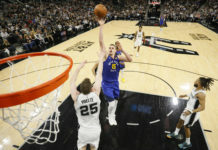 More than that — however — is the pressing need that faces the 2018-19 version of the Denver Nuggets. It simply remains a fact that the Nuggets have no actual small forwards on their roster now that Wilson Chandler has been traded to the Philadelphia 76ers. 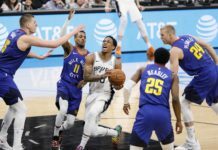 While the prospect of Will Barton is intriguing, simply for his offensive potential, the 6’5″ swing guard is a mere one inch taller than Gary Harris, who himself is undersized for a shooting guard. Until first round pick Michael Porter Jr. is ready to come back from injury, the Nuggets simply don’t have any…size. A Melo return would mean the Nuggets would have a normal-sized wing player, however it wouldn’t improve the defense (that goes without saying). That doesn’t mean the 2018 version of Carmelo Anthony would be a fit. 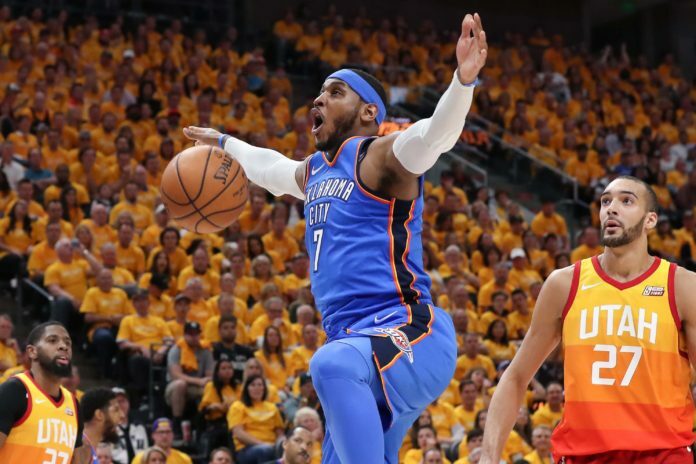 In pure basketball terms, Melo at 34 and with the type of game he plays, wouldn’t necessarily be compatible with what the Nuggets are trying to do. Unless — with that being said — he is willing to take a reserve roll on the team and help a young squad return to the playoffs. Melo coming off the bench for this Nuggets squad would actually be somewhat of a game-changer considering the rather shaky state of their bench if Barton is a starter. Reclaiming your legacy can come in many different forms, and if Carmelo wanted to go that direction, he would do what he could to contribute and be great regardless of role. Is that desire burning in the former Syracuse star at this point in his career? That is the question Melo himself needs to answer regardless of what team he plays with next season. Can Melo return on a white horse and fit in with an up-and-coming Nuggets squad or will he go elsewhere? I would wager his destiny is to be elsewhere.